Although this section covers the removal or replacement of a 1965 door panel on a Ford Mustang, the procedure also applies to 1966,1967,1968,1969 and 1970 Mustangs with either a standard interior, a pony interior, or a deluxe interior. Any changes are noted in the applicable sections. For 2005 and later cars, check the applicable section on the navigation column on the left. Remove the crank handle and door opener handle from the door. 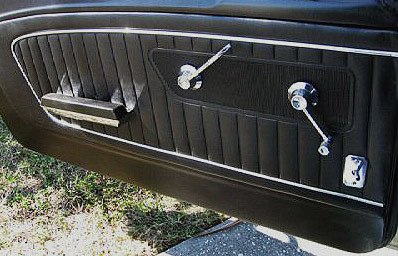 Early Mustang model doors such as the 1964 1/2 and some transition 1965 cars use metal clips to hold the handles on invisibly. A special clip removal tool is available for less then $10 but if you are careful and not prone to swearing, its possible to remove these using two fairly thick slot head screwdrivers. The 1966, 1967, 1968, 1969 and 1970 standard handles use a set screw in the middle of the handle to retain it to the crank gear or the Mustang inner door handle. Remove the door handle screws and remove the arm rest assembly. Gently slide a screwdriver between the door panel and the inner door and slide it as close as you can get to the nearest panel clip. Pry it outward until it pops out. Note: If you pry too far away from the clip, you can tear the panel. Install the new part in the reverse order of removal. Doesn't that new Mustang door panel look good? In terms of removal or replacement there is little difference between a deluxe 1965 door panel ( pony interior)or the standard one. Each type attaches via door clips. However, where the standard door features a 1 or 2 piece arm rest assembly (depending on manufacturer) which attaches through the panel into the steel inner door with 2 screws, the pony interior door panel's arm rest is molded into the panels and requires the addition of a plastic cup assembly screwed into a steel bracket for reinforcement. If you are restoring a pony interior your door should already have the bracket and depending on the condition of the cup, may also be reused. However, if you are in the process of upgrading from a standard interior, you must also include a new bracket and cup. What About Your Inner Door Surface ? You may have noticed the same thing I always do, when I start replacing my door panels. The inner door surfaces which previously looked pretty good with the old ratty panels, now, especially on early Classic Mustangs, show poorly. It's a little more work, but, if you have a few extra hours, you can restore that nice leather look, stamped steel panel to it's original pristine condition. Restoring your inner door before adding the new door panel is simple and quick, but the difference between a great job and a mess is attention to detail. For best results, strip the original paint off the stamped steel rather than sanding the old stuff off. If you sand and seal it, your original "leather look" stampings will be gone. That's why you need to remove the old paint entirely. 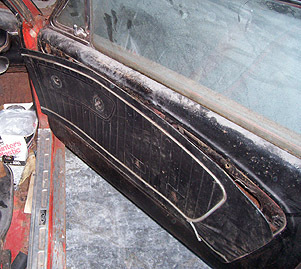 Even scuffing the old paint and repainting over the original paint can cause the grain to fill in and smooth out the oem stampings, making your 1965 door panel restoration not look right. Looking for cheap Mustang insurance? This new article shows you what you need to know to get the best price and coverage when shopping for cheap Mustang Insurance. Return from 1965 door panel to Mustang-door-panel replacement.